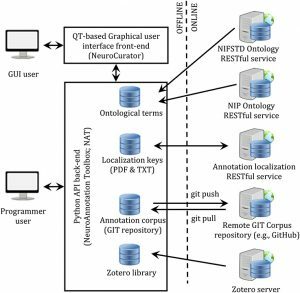 The publication aims at providing a set of tools that enables neuroscientists to collaboratively develop and share corpora of manually generated literature annotations. Such corpora can then be used in the context of computational neuroscience projects to build highly detailed models of extensive microcircuits, as previously showcased by the Blue Brain project (e.g., see the publication Reconstruction and Simulation of Neocortical Microcircuitry, Cell October 2015). Aside from describing the whole software framework put forward (see the figure below for a schematic representation of this framework), this new publication also reports on an annotation format that has been developed to support such use cases. The authors demonstrate the use of this framework with two hand-on examples using Python Jupyter notebooks. Further, they release a demonstration corpus of annotations related with thalamo-cortical microcircuitry. Of note, every piece of this framework has been released as open source software, in hope to promote its adoption and contribute in establishing more systematic and reusable literature curation. 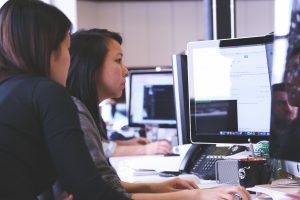 This important groundwork lays a foundation on which text mining tools can be built to provide some level of automation or provide assistance to speed-up the time-consuming work necessary by manual literature curation. Tools that would provide such support are currently being developed in the context of the OpenMinTeD community driven applications work package (WP9).